I'm trying to multitask today, so I'm combining MJ's sketch challenge with my Day 3 Reveal for Artistic Outpost. 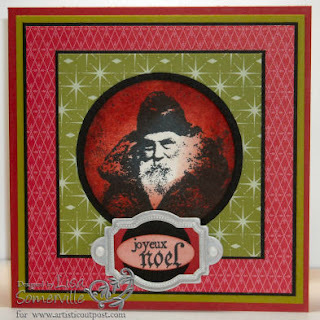 I just love the sketch MJ used this week - and it works wonderfully with my Santa image from Artistic Outpost's Snowy Woods Plate. Some other new elements on my card today - the DSP is from Ski Slope, available in the Holiday Mini starting October 1. The Vanilla Hodgepodge Hardware can be found in the Fall/Winter Idea Book and Catalog. On my sample, I've added some black ink to age it a bit. 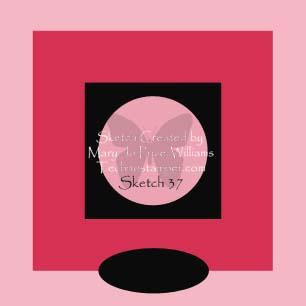 Here's MJ's original sketch if you'd like to play along, just leave a link to your blog here, or use keyword TSSC37 if uploading to SCS. More kudos for you! This is outstanding artwork! This is absolutely jaw dropping gorgeous. AWESOME! Wow! I love the color combination used on it and love the Vanilla hodgepodge! WOW! I love this! Great colors and layout! Your work is stunning as always! Fabulous! Santa never looked so good! Cute card Lisa! We both used silver hardware. What a super card! You really make that Santa look GOOD! I love your card and the santa stamp is awesome! ooooh...aaaah! Looooooooove this! Really lovely! Your card is stunning, the colors are so rich and love what you've done with the layout.